Visual Lure just helped Wilke Window & Door launch a new custom WordPress website. Wilke is a window and door company with showrooms in Shiloh, IL, Fenton, MO and St. Charles, MO. They serve the entire St. Louis Metropolitan area and all of Southern Illinois. In addition to windows and doors, they also carry columns, copper roofs, cupolas, fire place mantels, locksets, shutters & siding, skylights, staircase railing and trim & mouldings. They’ve been in business for over 50 years with a simple business model based on offering high quality products and treating customers right (our favorite types of business to work with). The new website was built in WordPress using a fully custom designed theme. WordPress will allow Wilke to edit and maintain the entire website in-house (with less than a couple hours of training). The site is responsive, rendering beautifully on all types of devices, which provides for a great user experience. It also features a sliding Request a Quote form, a custom testimonials widget, an accordian showroom contact section and more. In addition to web design and development, we also provided search engine optimization (SEO) services. Below is the new home page design. Please visit www.wilkewindow.com to view the new website. 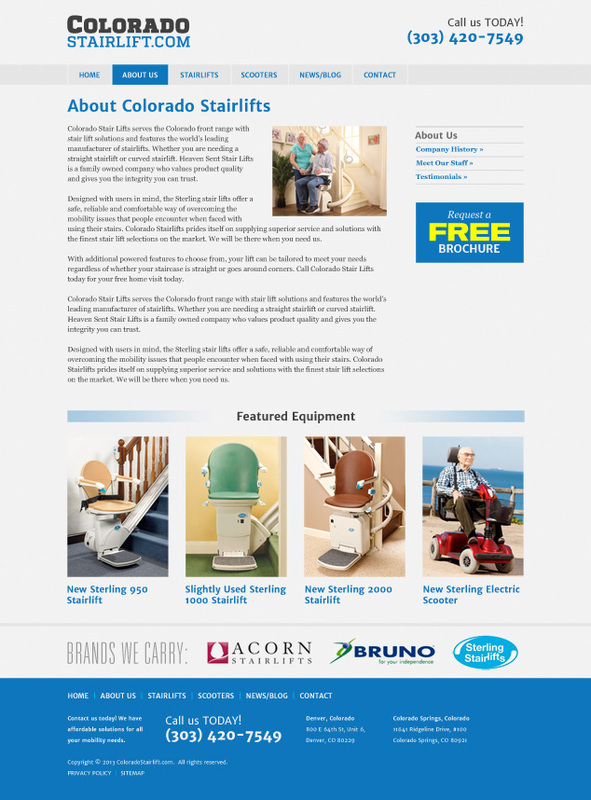 Visual Lure was recently contracted by a Colorado web development company to design website layouts for ColoradoStairlift.com, a Denver based stairlift company. 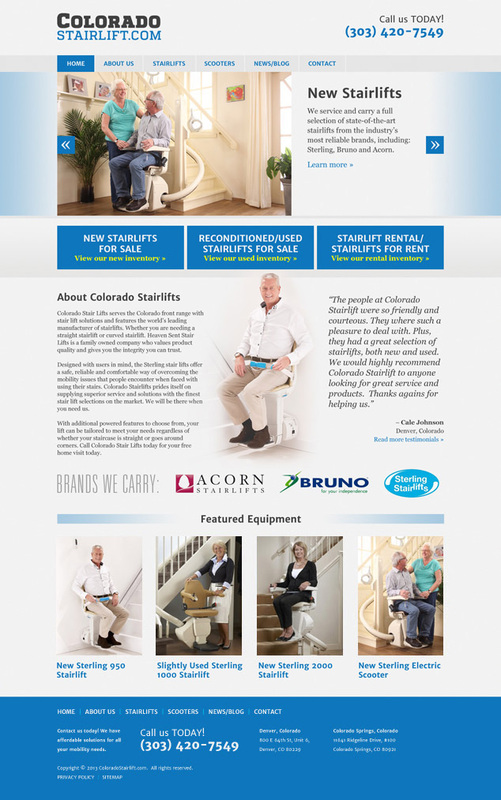 The company sells new and used stairlifts, and also provides rentals. 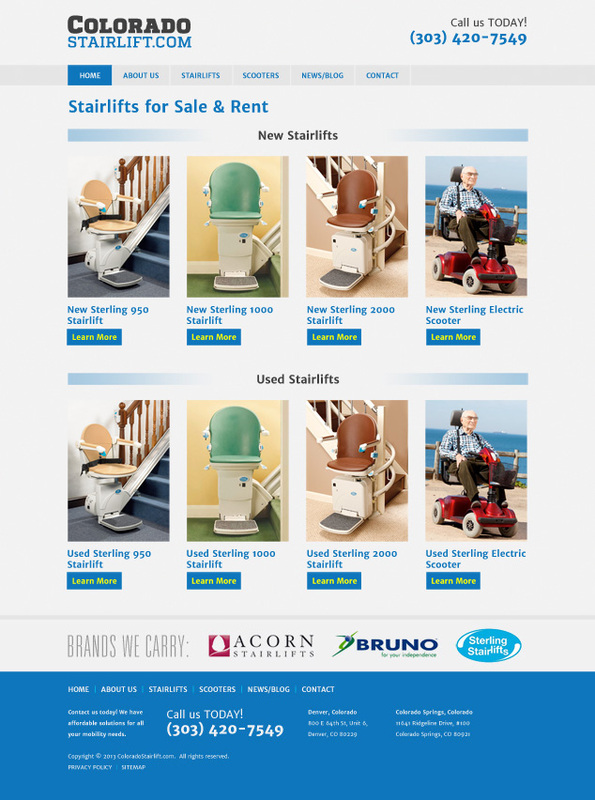 We went with a clean simple design with large text as their target audience is the elderly. Below are the initial webpage designs we provided the development company, as they will be doing the actual construction and build out of the site. 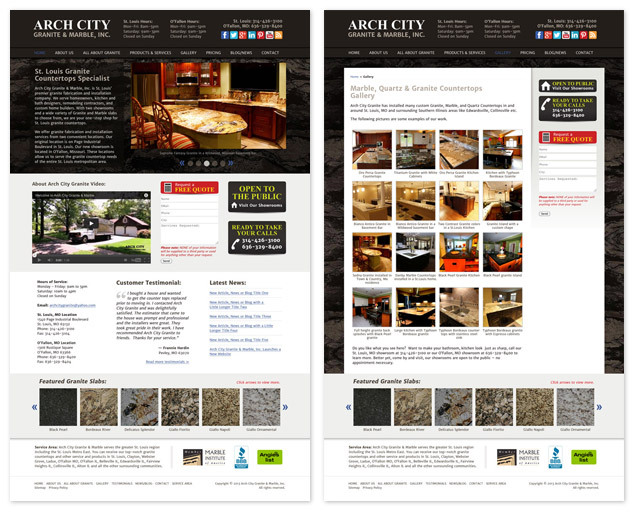 Visual Lure recently launched Arch City Granite & Marble’s new custom WordPress website. Arch City Granite is a St. Louis, MO granite countertops company with two locations in the St. Louis metropolitan area, one in the city and the other in O’Fallon, MO. They specialize in high quality fabrication and installation of granite, marble, quartz and soapstone countertops. Along with providing web design and development services, we also search engine optimized the website and worked with a third party SEO specialist. 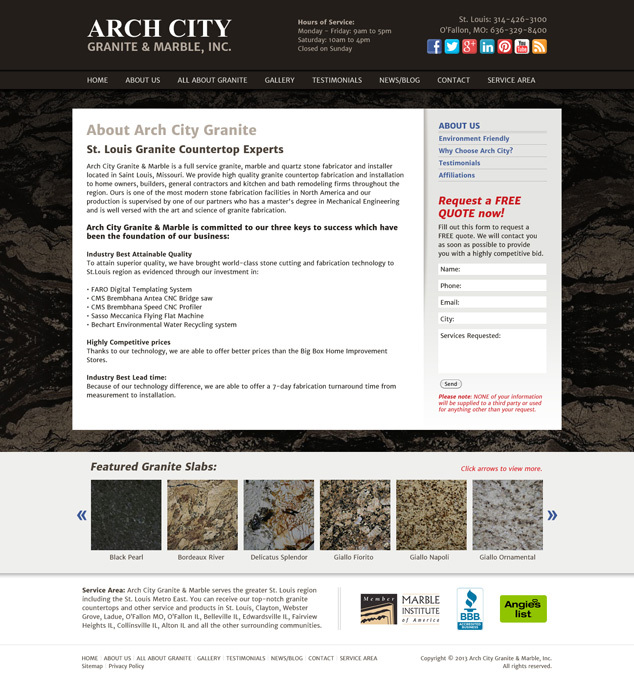 Check out the new website at ArchCityGranite.com. Learn more about our Word Press design, web design and Search Engine Optimization (SEO) services, and don’t forget to check out our web design portfolio. 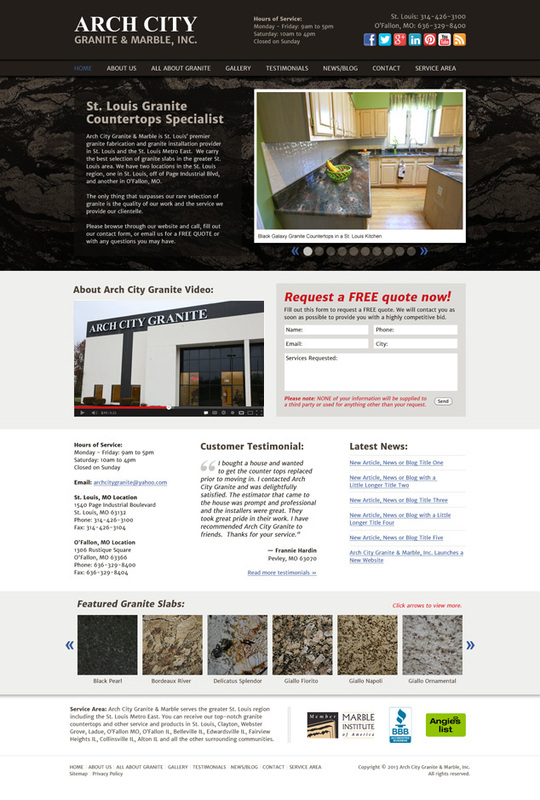 Visual Lure was recently contracted to design a new custom WordPress website for Arch City Granite & Marble, Inc. Arch City Granite is a St. Louis based granite company with showrooms in St. Louis and O’Fallon, MO. They specialize in fabricating and installing granite countertops using state-of-the-art equipment. They take pride in their quality of work and have one of the finest selections of granite in the greater St. Louis area. Below is the new home page design along with a sample sub-page. The new website will be built using a custom WordPress theme and we will also be provide search engine optimization (SEO) services. Check back soon for the official launch of the new website.